I was going to leave this for a few weeks because I’ll probably be tweaking the transcripts for ages yet, but decided to do it now as a sort of Valentine gift to the few members of the fandom who still might be interested in such a thing. So all the transcripts - from A Study in Pink (both the broadcast version and the pilot), all the way through Many Happy Returns and the Special, right the way up to and including The Final Problem - are now downloadable as Word or PDF files. There’s a file of all the transcripts in their entirety; a file of just the speaker and spoken words in every episode; and a file giving all the words spoken by 27 individual characters listed together, e.g. every line spoken in all episodes by Mycroft, or by John, or by Mrs Hudson etc. And for those people who have already got heavily annotated/edited earlier versions of the transcripts, there are also Season 4 only versions of the full transcripts and of the speakers and spoken words. Well, with the venom going on in certain areas of Tumblr, I was beginning to think that I was in the minority of liking Season 4, and wondered if everyone else had abandoned it and therefore wouldn't be interested in seeing transcripts. My hope, on the other hand, was that maybe some people would read them and then think, "Well, maybe the series wasn't as bad as I originally thought." If I bring just a few people back to the fold, it will all have been worth it. Thank you for the card, which weirdly I can't see at all on my PC. I had to look this page up on my mobile before I could see the pictures. But there's nothing wrong with a Valentine's treasure hunt! Since I also like Season 4 (or at least I don't actively dislike it), I think we are in the minority of liking season 4, and I also understand why a lot of people don't like it. Even though I DO like it, it is certainly not my favourite, but I think there is one thing that should be appreciated, even by those who feel disappointed by the episodes - I really think both Benedict and Martin were absolutely on top form as actors, and their art is a pleasure to watch in and for itself. sums it up for me. The boys were phenomenal, and I wouldn't have missed Season 4 for anything, because they were truly amazing. I was convinced that Martin in particular would be a shoe-in for Best Supporting Actor if The Lying Detective was put forward as next year's BAFTA/Emmy entry ... until Sian Brooke blew him out of the water by revealing at the end that she had brilliantly played three different people; and I wouldn't be surprised if Toby Jones is also considered. 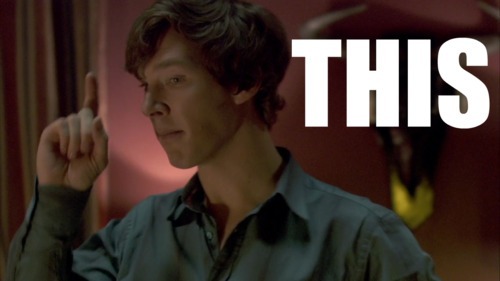 But both Martin and Ben deserve all the nominations in the next round of TV awards. I really, really do appreciate how good an actress Sian is, I really do. I just didn't care for her character at all! I thought she took too much space and time and eventually I really didn't care what happened to her. She wasn't just a villain who comes and goes, like Toby Jones's character, and yet the whole idea with the long forgotten evil genius sister didn't work for me. I would have preferred if they decided to expand the evil red headed flirt story, without turning it into the Holmes family tragedy. That said, of course she was very good. But Martin/John broke my heart, Benedict/Sherlock stole my heart all over again, and Sian/Eurus mostly annoyed me. Still, as an actress she deserves awards. About the image... *facepalms* I always add a link to the source when I add an image to a comment, because sometimes people can't see the image and also because I want to credit the artist. It was late when I sent the comment, I went to bed immediately afterwards, and as I falling asleep, out of the blue, I suddenly realised, "Damn, I didn't add the source." TOO LATE. :D Anyway, here it is, even if it's a couple of days late, because I'm thorough like that. It's never too late for a Sherlockian Valentine! Thank you. As the Hillywood girls say, this is bl... awesome! THANK YOU! Thank you so much, your work is appreciated! It's kind of you to say so. Thank you! Of course it is appreciated!!! And it's a lovely Valentine gift! THANK YOU THANK YOU THANK YOU for all that you do! I enjoyed S4 overall very much, so I'm certainly planning to stick around. Your transcripts are a huge help to me as a fan and a fic writer and someone who just loves to see the show from as many different angles as possible. It's an invaluable gift to us, and you can't possibly get thanked enough. Aww, you're sweet to say so! Many thanks. This is such an amazing contribution to the fandom, thank you!